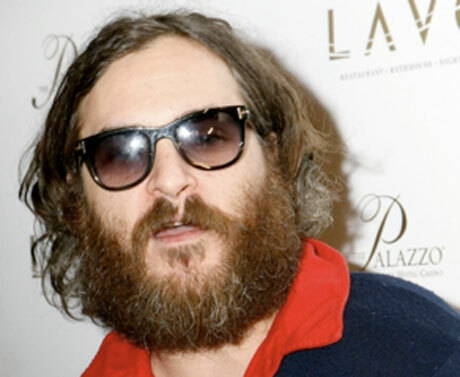 As part of our semi-regular attempts to deliver news that's straight-up WTF, we've stumbled upon this tasty titbit of celebrity gossip: Joaquin Phoenix has ditched acting for a rap career. According to reports (such as this one), the Oscar-nominated "former" actor has set his sights on being an MC and is going from Johnny Cash to Eminem. What's more is that Phoenix (who has been given the moniker of "Joke P" by some critical gossip sites) plans to have his road to what's destined to be hip-hop failure filmed in a new documentary, which will lead up to the star reportedly recording an album with Sean "Diddy" Combs. The yet-untitled documentary is to be directed by actor Casey Affleck - Ben's younger brother and Phoenix's brother-in-law - and was to kick off filming last weekend at a Las Vegas club. Yes, we know that on page this may all be hard to believe but if you're in disbelief just check out this video by the ever-watchful TMZ, who caught a very Jim Morrison-looking Phoenix "rapping" at a club in Culver City, CA, last month. In the words of TMZ: "If this freestyle disaster is any clue as to how his music career will go, let's just say it's DOA." A sentiment we're going to have to agree with on this one.